I purchased the Top Dog Trading indicators in 2011. They’re available in two downloads, sold separately or in a bundle for Metatrader 4, Ninja Trader, and Trade Station. I purchased the Metatrader 4 bundle. After the purchase, you are required to send an email to support for a custom software key (or two keys). Then you’re up and running. These indicators are designed to complement the Top Dog Trading system, but are they worth the investment? In this Top Dog Trading indicators review, I’ll give you my honest opinion of these custom indicators. Although I bought all of the indicators, I don’t use them all. It’s only recommended to apply the indicators that you need because some of them can be resource hungry. In my Top Dog Trading Indicators review, I’ve listed the indicators by order of importance. I’ll talk about the indicators that I found to be the most useful first, and so on, until the last, and least useful, indicator. The chart above shows the waves indicator. Using trend waves (different than Elliot waves) is an important part of the Top Dog Trading system. As far as spotting trading entries, this indicator is pretty useful. With a quick glance at the chart above, I can see several possible trend trading setups, and, at least, a couple of “Rubber Band” trading setups. Of course, waves are only a part of the trading system. They don’t tell the full story of any trading setup, but it is a useful filter to apply when quickly scanning many pairs for trading setups. As far as I’m concerned, the waves indicator is the most useful out of all of the Top Dog Trading indicators in this review. In the chart above, you can see the cycles indicator, which is a stochastic oscillator that automatically plots “mini-divergence.” This indicator helps you get a picture of where you are in the current cycle of the market, and it also helps you identify the “Second Chance” patterns that are taught in the trading course. Cycles are an important part of the Top Dog Trading system. Cycles, combined with waves (trend), support and resistance, and fractals, are essential to the trading method taught in Foundations Course #1, which is why this is the second most useful indicator, in my opinion. Note: In order to use fractals in Metatrader 4, the way Barry recommends using them, you need to be able to create custom time frames. In the chart above, you can see the Top Dog Trading momentum indicator, which is a modified MACD indicator. In Foundations Course #2, momentum is introduced as the fifth market energy. A modified MACD indicator is the key component to measuring the momentum in the market using this trading system. This custom indicator helps you quickly count waves in momentum and determine the overall direction of momentum. As momentum (and measuring it the way Barry does) is also a very important part of this trading system, I found this indicator to pretty useful when scanning for setups. The chart above shows the Fibonacci retracement indicator. 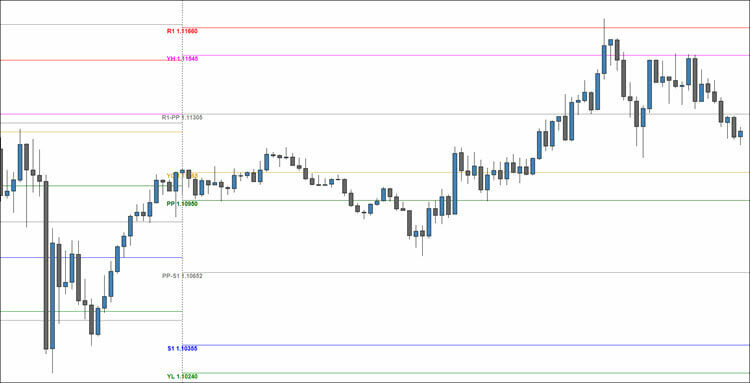 As you may have guessed, it automatically plots your Fibonacci retracement levels for you. This can be a useful tool if you know how to use Fibonacci levels. Fibonacci retracement levels aren’t a key component to the trading method taught in Foundations Courses #1 or #2, which is why I didn’t rank this tool higher in usefulness to Barry’s basic trading system. However, Barry does sell a separate Fibonacci retracement course. The chart above shows the Top Dog Trading candlestick timer. This indicator is very useful to any trading system, and it’s hard to believe that a candlestick timer is not a default feature in every trading platform. The Top Dog Trading candlestick timer is the only timer that I used for years; however, I use this free candlestick timer now, because it’s a pain to get the secure key changed to each new account that I want to use this timer on. Also, if you want to use this timer on more than two accounts, you’re out of luck (more on these points later). The chart above shows the Top Dog Trading swing points indicator. Of course, it’s always better to manually plot your support and resistance levels, because doing this properly can be the difference between making consistent money and losing consistently with many trading systems. 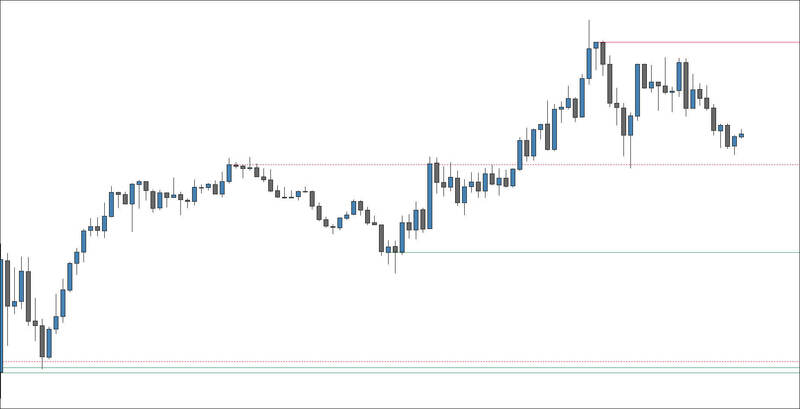 Note: If you’d like to learn how to use support and resistance like a pro, download my free eBook, How to Choose Better Support and Resistance Levels. Choosing good horizontal support and resistance levels is too subjective an art to be programmed into any indicator. Some indicators can be helpful with certain trading strategies, but you should never fully rely on an indicator to choose your support and resistance levels. The chart above shows the custom pivot points indicator. I’ll admit that I don’t currently use pivot points in my own trading. I know some people find them very useful, so you may get more out of this indicator than I do. Like I mentioned earlier, I manually plot all of my support and resistance levels, and I suggest that you do the same. However, if you’re interested in a free alternative to this pivot point indicator, check out this support and resistance indicator for MT4. Finally, you can see the custom mini swings, medium swings, and candlestick signal indicator. The indicator basically helps to point out certain candlestick signals, i.e., engulfing patterns, shooting stars, and hammers. It also helps you to identify medium and mini swings in price. As none of these things were ever covered in the Foundations Courses, I have rated it as the least useful in my Top Dog Trading indicators review. I have never used this indicator, other than applying it to my charts to take this screen capture. Note: If you’d like to learn more about trading candlestick patterns, check out my free price action course. Now you know what the Top Dog Trading indicators do, and you’ve seen that some of these indicators can be useful, but do you really need them? Let’s go over a few things before I answer this. The Top Dog Trading indicators can be useful when it comes to scanning pairs for trading setups. Barry teaches a unique, and somewhat complicated, trading system. Having some of these indicators on your charts can help you recognize good trading setups, especially when you’re first starting out. I got them when I was still learning this trading system, and I feel like they helped me learn the system faster. I save each pair and set of time frames that I trade with the Top Dog Trading system in a separate profile in Metatrader 4. It’s nice to be able to switch between profiles and quickly know if I have a possible trade setting up. As I’ve mentioned reviewing Barry’s Foundations courses, the support staff is always quick and courteous. That’s a good thing, considering you’ll have to contact them every time you wish to use your indicators in a new trading account or demo account. First of all, the security key system is annoying. You can only use your indicators on two accounts. You are assigned two security keys which have to be set, through email to support only, to your trading account numbers. Anytime you change accounts, you must send support an email requesting to change one of your account keys to your new account number. This antiquated security system causes other problems too. For some reason, every time you re-open your charts, you need to re-enter your security key into each indicator. As you can imagine, this could be a real nightmare practically speaking. Luckily, switching to the next or previous profile automatically re-enters all of the security keys. You can also simply switch time frames back and forth to fix the problem. I’m not sure why that doesn’t happen on load, but it doesn’t. This is made even more annoying when you see another system that does it so much better. 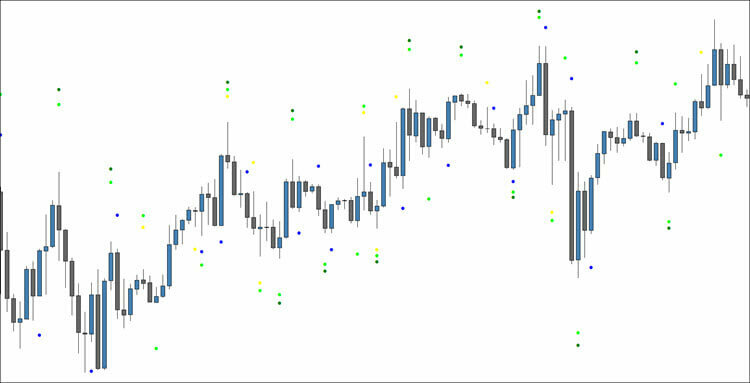 For instance, the Forex Gemini Code, which I reviewed a few weeks back, uses a few custom indicators. However, you simply enter the email you used when signing up to the course as your security key. You hit “OK” one time, and you’re done. Your email doesn’t not need to be re-entered each time you open your charts. If you get a refund, they’d just take your email off the cleared list. Also, you can use those indicators on as many accounts as you’d like. As I mentioned earlier, these indicators can be resource hungry, especially the momentum and wave indicators. That’s not a big deal though, as lowering the CalcBars number and only applying the indicators that you really need can greatly reduce the strain on your system. Barry’s custom indicators for the Top Dog Trading system can be helpful for quickly spotting trading setups, especially when you’re learning to trade the system. I use the waves, cycles, and momentum indicators together when trading this system. I also use a similar free candlestick timer in every system that I trade. I can’t go without it. The security key system is my biggest gripe. There are much easier ways to implement a security system that would be more practical for Barry’s customers and support staff alike. Other systems do this so much better. It would be nice to see Barry adopt a different method. Are the Top Dog Trading indicators helpful to new students? Yes. I’d say that they are. Do you need these indicators? No. I don’t think they are necessary, even for students who are learning the trading system. Unless you are having a very difficult time spotting any trading setups, you could probably put your money to better use elsewhere. I hope you enjoyed this Top Dog Trading indicators review. Was this review helpful? Let me know what you think in the comments below. Where did you purchase Top Dog Trading Indicators? If you’ve taken the Top Dog Trading course, you should have received an email with a link to them. If not, just email Barry. I’m sure he’d be happy to send you a link. Thanks for the kind words, George. Like I mentioned to RH, if you’ve taken Barry’s course, you should get an email for the indicators. If you haven’t gotten the email, just shoot Barry a quick email, and he’ll gladly send you the link. If you’re trying to download them for free, that’s not going to work. To use the indicators, you have to enter an activation code upon installation. At purchase, you get two codes, which have to be synced by Barry’s staff to your trading account(s) (up to two). Good day, i would like to have your candlestick pattern indicator. kindly help me with the indicator. Are you talking about the candlestick pattern indicators from this article: https://www.fxdayjob.com/candlestick-pattern-indicator-mt4? If so, two of them are free and their download links are in the article. One is a premium indicator. You have to buy that one if you want it. Some of these indicators are very good and very useful if you’re a Top Dog Trading student.